For the launch of the Carnival Breeze, the company is taking an innovative approach with social media, showcasing the new ship with a series of video vignettes shot by a first-time Carnival cruiser Janell Wheeler who will document her experiences through Facebook, Twitter and Pinterest. She’ll also engage fans with live Twitter chats and Google Hangouts, as well as with interactive polls to determine the next chapter in her exciting seagoing adventure. 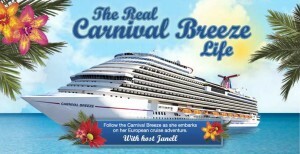 The campaign kicks off June 2 in anticipation of the Carnival Breeze’s inaugural 12-day Mediterranean cruise which departs Venice, Italy, June 3. Footage of Wheeler will be shot using a hand-held digital camera, lending a spontaneous “you-are-there” feeling to the series. Viewers can tag along with former American Idol contestant as she prepares to set sail on the new vessel, following her as she leaves her hometown of Nashville bound for Italy, posting images and videos, tweeting and interacting with the audience every step of the way. Wheeler’s experiences will be front and center as she takes viewers on a whirlwind tour of Carnival Breeze’s many new features, with on-line polls deciding which of the ship’s many innovations she’ll experience next, from the Thrill Theater to delicious new dining choices such as Bonsai Sushi and Fat Jimmy’s C-Side BBQ. Viewers can also come along for some splash-tastic fun as Wheeler propels down the ship’s 312-foot-long Twister water slide or gets a bird’s eye view of the Mediterranean as she straps on a harness and gives the ship’s suspended ropes course a try. Each of the action-packed one- to two-minute vignettes begins and ends with an insightful “video confessional” in which Wheeler outlines her plans for the day and offers her own unique perspective on her experiences thus far. Wheeler will also be uploading photos of her latest happenings via Pinterest and taking viewer questions live via Twitter. She’ll also host a live Twitter chat during the cruise. A YouTube playlist will also be created, providing viewers with an at-a-glance view of Wheeler’s ongoing Carnival Breeze adventure.